This artist's interpretation shows Japan's Kaguya satellite in lunar orbit after jettisoning one of its smaller satellites. Japan'smassive Kaguya lunar orbiter stands poised to launch spaceward this week on amission that, researchers hope, will unlock the secrets of the moon. Equippedwith a veritable arsenal of science instruments and two baby satellites, thethree-ton moon probe is set to liftoff from Japan early Friday (Local Time) ona one-year mission to Earth's nearest neighbor. ? "TheJapanese people are very interested in this mission," said Shinichi Sobue,Kaguya's science coordinator and public outreach for the Japan AerospaceExploration Agency (JAXA). "Kaguya, or SELENE, is our first mission for reallyobserving the moon." Japan launcheda previous lunar mission in 1990, but the flight served primarily as atechnology demonstrator, Sobue told SPACE.com. That mission -- dubbedMuses-A -- sent the Hiten spacecraft on a series of lunar flybys and orbits, releasedthe small microsatellite Hagoromo and intentionally crashed into the moon'ssurface in 1993. Kaguya's SELenologicaland ENgineering Explorer (SELENE) mission, meanwhile, is designed for in-depth lunarstudy. The probe is slated to lift off atop an H-2A rocket from Japan'sTanegashima Space Center on Sept. 13 at 9:31 p.m. EDT (0131 Sept. 14 GMT),though it will be Friday morning at the island launch site. The 55billion yen (about $480 million) mission was postponed by 24 hours on Tuesdaydue to bad weather. It has also been plagued by a series of other delays --most-recently due to improperlyinstalled condensers on its passenger satellites -- throughout its eight-yeardevelopment, JAXA officials have said. Touted byJAXA as the largest lunar mission since NASA's manned Apollo flights, Kaguya isnamed after a moon princess in a Japanese folktale and carries 14 primaryscience instruments to map the lunar surface and study its composition, subsurfaceand gravity field. "Throughthese research activities, it is hoped that we can get closer to the core ofthe mystery of the origin and evolution of the moon," Kaguya's SELENEproject manager Yoshisada Takizawa has said in a JAXA Web site statement. The6,000-pound (2,271-kilogram) Kaguya spacecraft is a nearly seven-foot(2.1-meter) wide box that stands almost 16 feet (4.8 meters) tall. Theprobe's X-ray and Gamma-ray spectrometers will track the distribution ofelements on the lunar surface such as hydrogen, which researchers hope will helpaid in the search for water ice onthe moon, Sobue said. Otherinstrument suites will study mineral distribution on the moon's surface; usecameras, radar and lasers to catalogue lunar terrain and subsurface structure; andprobe the moon's ionosphere and magnetic field. A high-definition camera is alsolaunching aboard Kaguya, but is destined for a more aesthetic purpose. "TheJapanese people would like to see the very beautiful, high-definition movies ofthe Earth rising" over the moon, Sobue said. Atop theorbiter sit the relay(RSAT) and VRAD microsatellites, two solar-powered probes about three feet(one meter) in diameter. Kaguya will jettison the 110-pound (50-kilogram) probesas it enters lunar orbit. The two satellites are designed to then work togetherwith their mothership to generate a complete global map of the moon'sgravitational field. VRAD will also probe the moon's thin ionosphere, JAXAofficials said. "It'sthe first [mission] ever to study the gravity field of the far side of themoon," Sobue said of Kaguya's mission. "The data accumulated bySELENE should serve as a basis for mankind's future utilization of the moon." 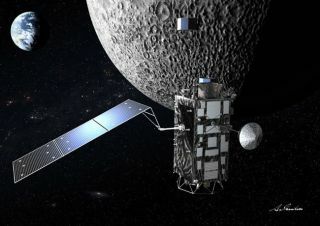 JAXAmission scientists already plan to share Kaguya's gravity field measurementswith NASA researchers as the U.S. space agency prepares to launch its ownmission - the Lunar Reconnaissance Orbiter (LRO) - in 2008 and returnastronauts to the moon by 2020, Sobue said. Japan, too,hopes to work with international partners to develop a lunar base as part theagency's strategic vision 2025, he added. "Thus,Kaguya will also contribute to the manned exploration of the moon,"Takizawa stated. Afterlaunch, Kaguya is expected to orbit Earth about 2.5 times before beginning thefive-day trek to the moon, Sobue said. Thespacecraft is designed to enter into a polar lunar orbit, and then deploy the RSATand VRAD microsatellite before ultimately settling into a 62-mile(100-kilometer) high orbit around the moon. The probe's one-year science missionshould begin in earnest after a three-month checkout period, Sobue said. Kaguya isthe first of series of new spacecraft bound for the moon over the next twoyears. China plansto launch its firstmoon shot Chang'e-1 sometime later this year, with NASA's LRO and India'sChandrayaan-1 spacecraftset to fly in 2008. Japan also plans to follow Kaguya's flight with more ambitiousmissions under the SELENE banner, JAXA officials said. "[W]ewill plan to have SELENE follow-on missions for moon landing and samplereturn," Sobue said.